The real power of a cloud-hosted, fully managed service like MongoDB Atlas is that you can create whole new database deployment architectures automatically, using the services API. Getting to the MongoDB Atlas API is relatively simple and, once unlocked, it opens up a massive opportunity to integrate and automate the management of database deployments from creation to deletion. The API itself is an extensive REST API, there's role-based access control and you can have user or app-specific credentials to access it. There is one tiny thing that can trip people up though. The credentials have to be passed over using the digest authentication mechanism, not the more common basic authentication or using an issued token. Digest authentication, at its simplest, waits to get an HTTP 401 (not authorized) from the web endpoint. That response comes with data and the client then sends an encrypted form of the username and password as a digest and the server works with that. October 10-12, 2018 brought 1,000 developers to Vancouver, BC, Canada for the Node+JS Interactive 2018 conference. Put on by The Linux Foundation, the conference provided talks for two days followed by a day of workshops. MongoDB was a proud Bronze Sponsor of the event. This allowed us to have a booth in the Sponsor Showcase Hall along with having a presence at the Career Fair event. 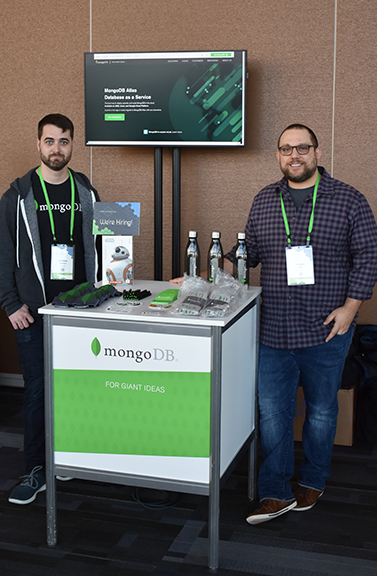 MongoDB had a great presence at Node+JS Interactive 2018. Aydrian Howard and I from the Developer Advocacy team were on hand to answer questions. Thomas Cirri was there from our Recruiting team. By the way, we’re hiring! Dan Aprahamian from our Node.js Driver team was there along with Gregg Brewster from MongoDB University. The Sponsor Showcase Hall was filled most of the day with people learning about all aspects of the Node.js ecosystem. The MongoDB booth was busy handing out swag and answering questions about MongoDB Atlas, MongoDB Stitch, MongoDB Charts, along with many other subjects and topics. 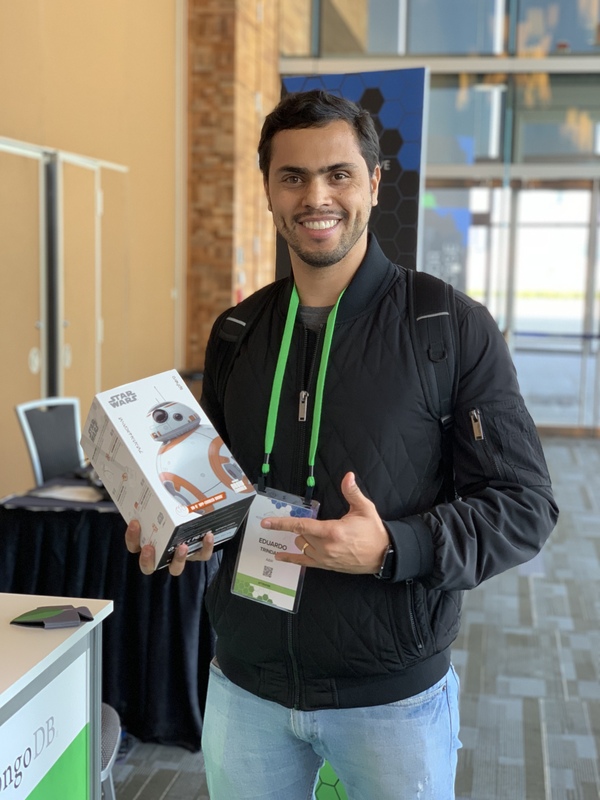 On Thursday, MongoDB held a drawing for a BB-8 Droid give-away which was won by Eduardo Trindade, System Analyst at A&W. Eduardo Trindade showing off his new BB-8 Droid prize. The schedule of session talks brought a wide variety of topics and speakers to Vancouver. Irina Shestak from MongoDB gave a great talk on HTTP/2 walking through the connection process one frame at a time and giving special attention to how Node.js implements this protocol. Jenna Zeigen’s talk From Parentheses to Perception: How Your Code Becomes Someone Else's Reality provided some wonderful information on the path from an idea in a developer’s mind, to pixels on the screen. There were many other talks from great speakers such as Tierney Cyren from NodeSource, Joe Karlsson from Best Buy, and Adam Baldwin from npm, just to name a few. Node+JS Interactive was hosted by the Vancouver Convention Center - West. Located in the West End area of Vancouver, it overlooks Vancouver Harbor and sits adjacent to the Olympic Cauldron at Jack Poole Plaza. Vancouver Harbour is not only a busy cargo port bringing in goods for Western Canada, but it is also a heavily trafficked float plane area with seaplanes taking off and landing throughout the day. It was quite a site to be in a conference center and looking out over the harbor’s spectacular scenery and seeing the seaplanes land, taxi, and take off in the crisp and clear fall air. If you missed us at Node+JS Interactive 2018 and have questions about MongoDB Atlas, MongoDB Stitch, MongoDB Charts, check them out today. It’s free to get started!